We went back to the old Valencia in the afternoon, this time with the rest of the group for a walking tour with some teachers. We used the Valencia Metro again which is why the multiple trip tickets come in handy and much cheaper. The cost of a single trip in Zone A or the inner city is 1,20€. But you can purchase a ten trip ticket for 6,10€. 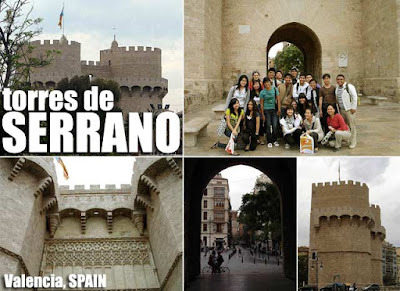 Our walk started at the Torres de Serrano, once the main gateof the city and one of two remaining gates from old Valencia. When the city expanded in the 19th Century, they got rid of the old city walls and most of the gates. 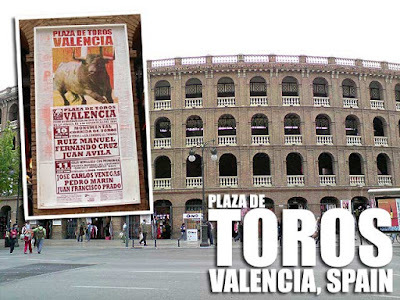 We made our way through the same attractions and ended up at the Plaza de Toros where bullfights are held. Again, we were lucky because of the upcoming fiesta, there are bullfights scheduled. So we’ll be buying tickets to that. After the tour, we chilled out (quite literally since it was cold and started to drizzle) at the horchateria in Plaza Sta. 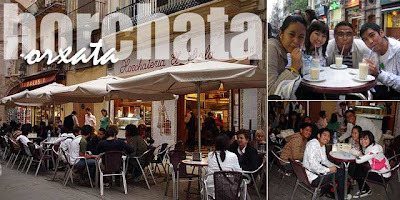 Catalina, one of the older and more popular horchaterias in Valencia. Horchata (or orxata in Valencian), is a sweet drink made of tigernuts or chufas. We spent 2€ a glass. The next afternoon, I found myself back in old Valencia exploring more of the place. We passed by even more churches (I wonder how many wishes I’ve gotten by now) and other historic structures. I’m featuring the churches in a later post. But the main reason I went back was to visit La Lonja de la Seda, the old silk market of Valencia which was inscribed in the UNESCO World Heritage List. 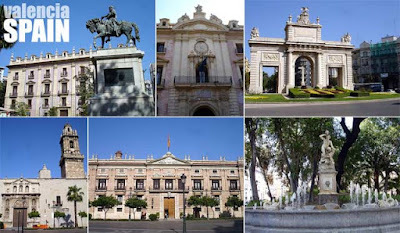 once i sat in a tour bus from madrid to valencia and wondered, when are we stopping for lunch? it's 2pm! i was so hungry i ate nearly all of the olives and bread for starters, ka hiya hiya! and dinner was the same story. Yeah, dinner at our host family is at 9pm! Haha! It's six hours in between meals!